Today on My Poetic Side we take a look at the post-boxes that have had a bit of a facelift for Valentine’s day. We also look at the poet Else Lasker-Schüler on the 150th anniversary of her birth. It is almost Valentine’s Day and that can only mean one thing; The Royal Mail has been decorating a number of their post-boxes again with excerpts of poetry from some of Britain’s greatest wordsmiths. 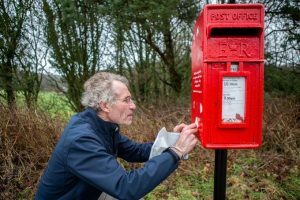 Royal Mail is hoping that their poetry project will help to rekindle the dying art of the handwritten love letter this year on Valentines Day. Four post-boxes located all over the country have been dedicated to different poets. The words of John Keats, Anna Seward, Robert Burns and Thomas Hardy have been carefully added to some of those iconic red post-boxes. 11th February marked the 150th anniversary of the birth of the radical expressionist poet Else Lasker-Schüle. The German-Jewish poet was a winner of the Kleist Prize and was known to be something of an eccentric. There are monuments to the poet, all of which portray her with a very stern expression, but there are not many. The place where she is born is marked only by two large dark slabs of granite. The building was destroyed during the bombing of World War II. Else Lasker-Schüler lost both her brother and her mother at a young age. She was married twice. Her second husband introduced her to the rather bohemian lifestyle that became the subject of a novel she wrote in 1912. She had one son; he died of Tuberculosis in 1927. She received the Kleist Prize in 1932, at the time the highest German literary prize there was. She moved to Switzerland shortly after having been assaulted several times on the street. In the years that followed she visited Palestine a number of times and in 1937 she made a permanent home in Jerusalem. 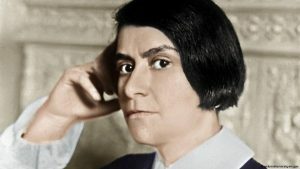 She was not able to return to Switzerland due to the outbreak of World War Two; instead, remaining in Jerusalem, where she passed away at the age of 75 in 1945. Her anniversary is being honoured in Germany with a commemorative stamp which shows an excerpt of one of her drawings.